The business Glossary serves as a focal point of any decision model and all goals inside the glossary are hyperlinked to the Excel files and decision tables which describe their business logic. Of course, along with decision tables a human decision modeler can use other “business knowledge models” but it doesn’t change the approach. 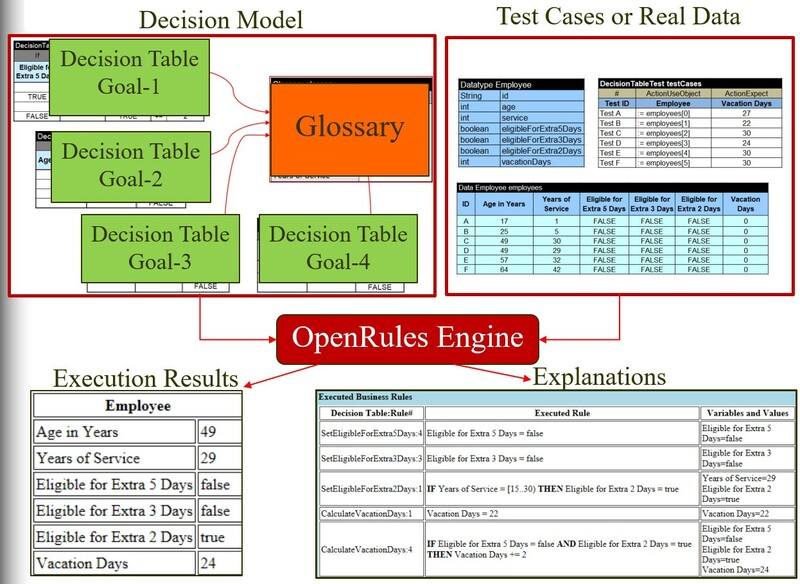 The new OpenRules release makes decision models more compact and easy to maintain. You may compare decision models implemented with OpenRules-7 (see the new downloadable workspace “openrules.models”) against the same models implemented with OpenRules-6 (see the old, but still downloadable workspace “openrules.dmn”) . The newly redesigned set of decision models in the repository “openrules.models” provides many good examples from a relatively simple “Credit Card Application” to a more complex “Loan Origination”. It is important to note that along with traditional single-hit and multi-hit decision tables, OpenRules will correctly build an execution path for those decision models that deal with collections, including complex iterations. I recommend you to take a look at the decision “Order Promotion” that has 3 levels of embedded iterations. The release 7.0.0 comes with a new graphical “Decision Model Analyzer”, a stand-alone web application built on top of OpenRules. It is freely available online from here. The Analyzer comes with a collection of predefined decision models and allows business users to add, execute, and analyze their own decision models. Now our potential customers can do serious evaluation of OpenRules capabilities without any downloads. The Analyzer can be downloaded with all sources and easily customized. See more details in the Release Notes and in the document “Getting Started”. The User Manual has been updated and essentially simplified. Now it consists of two parts: the first one is oriented to business analysts and the second – to developers who help business people to incorporate their models into existing enterprise-level applications. If you have any questions and/or suggestions for improvement, please post them at the Google Discussion Group or send directly to support@openrules.com. As always, OpenRules, Inc. provides highly reliable Technical Support, consulting and training services around our flagship product.